Log in on Saturday, October 19 (12 AM to 11:59 PM Pacific) and click the gift box icon on the left side of your game window to receive the following items! Mask Fragment (x5), Chaos Scroll 60%, and a RED Ticket! Log in on Sunday, October 20 (12 AM to 11:59 PM Pacific) and click the gift box icon on the left side of your game window to receive the following item! Mask Fragment (x5)! 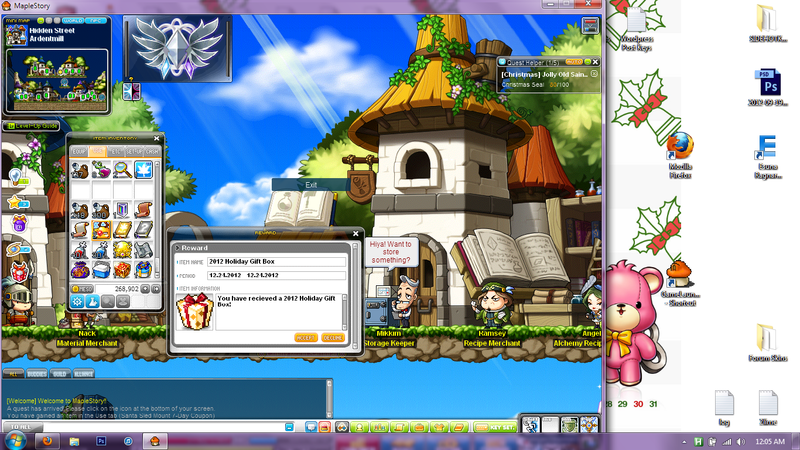 Celebrating Maplemas with 2x EXP & Drop + 24 hour Hot Time! NOTE: Confirmed that Hot Time starts at 12AM PST, not 12PM PST like the official announcement stated. MapleStory is feeling the Yuletide spirit and is having some fun events to show that. So clear out some time to enjoy 2x and participate in the Hot Time but don’t forget about your family and friends! NOTE: At 1:55am PST, the MapleStory forums blew up about 2x EXP Coupons NOT working with this event while it did work for about 20-30 minutes for some before it stopped and only the event bonus was attributed. Login on Monday, December 24 (Between 12 AM to 11:59 PM PST) to accept your Hot Time gift(s)! Christmas 2012 Medal! With a chance to win other special items. NOTE: Pretty sure you get a Tempest Giftbox and from there you open it. So chose carefully whom you which to accept these rewards on!